What can be done to solve the intractable problem of wildlife and feral cats? Ask Peter Paonessa. 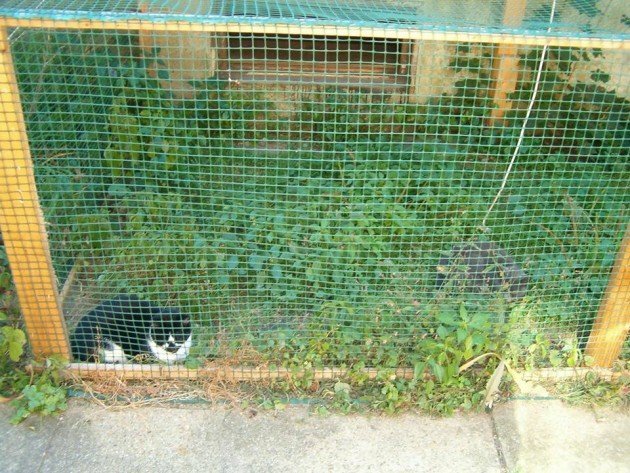 Peter, who lives in Salem, CT, noticed two feral cats living near his house. 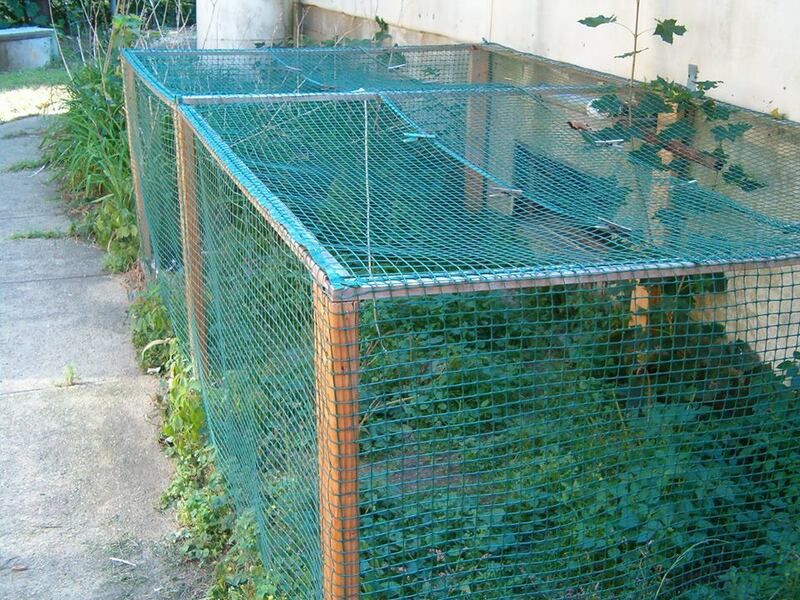 He trapped them, provided veterinary care for them, and released them … into his basement. Prior to their release he arranged his basement with litter boxes, a bed, and places to hide. He also built an 8’ long, 6’ wide, and 4’ high cage which he attached to the basement window, so fresh air and sun- or moonlight would be available to them at all times. Of course there was a settling-in period. They were afraid of people and not used to being inside. But unsurprisingly, they quickly grew accustomed to the man who made no demands on them, appeared daily with food and water, and gave them sanctuary. Have they become cuddly pets? No. But they are healthy, content, and they are safe. Peter, who loves cats, has saved two of them from the normally short and brutal life of a feral cat. And Peter, who loves wildlife, has saved hundreds – if not thousands – of birds and small animals from being killed by two more feral cats. Feral cat supporters: why not open your own homes to the animals you love – without demanding they become purring lap cats in return? Instead of rounding them up, providing minimal veterinary care, and dumping them back on the streets, why not actually rescue them? I can hear it already: I want to be involved in saving cats, but not that involved. If every feral cat supporter were to take personal responsibility for housing two or more unadoptable cats, the number of miserable, disease-ridden strays would plummet, and the populations of threatened and endangered wildlife would rise. And then the phrase “I don’t just love cats, I love all animals” might actually be believable. A nice sentiment about helping feral cats. The reality is that taking a few cats off the street and caring for them would not put a dent in the overall cat population. My only workable solution to stop cats from killing birds in my neighborhood was to stop feeding birds. Believe me I tried everything else first. Thanks for the comment, John. But if every single person working to guarantee ex-pets the right to kill protected wild species would put their money where their mouths are, it WOULD put a dent in the population. And there is another solution – trap the cats and get rid of them. That’s truly the best solution. Er…..I get the feeling you don’t like the kitties much…..
Leslie, I do like the kitties – when they’re inside houses, where they belong. Leslie–typical mindless, maudlin, emotional and utterly FALSE accusation. Because we oppose releasing non-native predators into the environment doesn’t mean we ‘don’t like kitties’. Do ANY of you imbecilic cat-hoarders talk (or think) like adults? My son is a gifted aquarist who captive-bred piranhas in a 120 gal tank while he was in college. He had a school of at least three generations, and pampered ’em. The fact that he was opposed to releasing them in the local reservoir didn’t mean he didn’t like them. But unlike you, I don’t let them outside. EVER. They have NEVER killed a native animal, bird or amphibian (no reptiles in AK). I get the feeling you don’t like wild animals and birds very much–you have no problem with letting your darling ‘pets’ shred and eat them alive. How CRUEL can you get?